With the back-to-school rush behind us, the email marketer’s attention now turns to the fast-approaching holiday season. We consulted Responsys’ yearly Retail Email Guide to the Holiday Season for some great suggestions on how to maximize your email marketing efforts as we head into prime retailing months. In this blog post, we’ll share some of the highlights that apply to businesses both large and small. Consumers start their holiday shopping early. According to the National Retail Federation, 40% of consumers begin gift shopping before Halloween (October 31), another 40% begin in November, and the remaining 20% in December. As a result, many of the top retailers start their email campaigns early to capitalize on these shoppers. 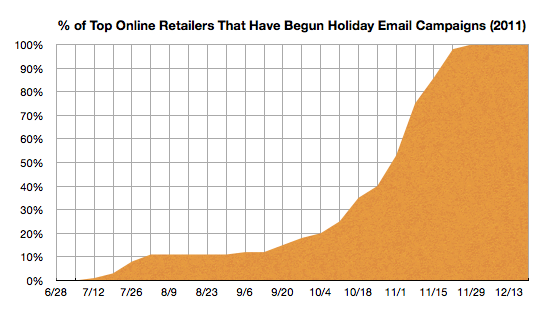 This move to Thanksgiving Day is driven, in part, by the rise of mobile email. Since odds are your email will be read on a mobile device, take the time to make sure it looks good on the small screen. Email templates that come with Direct Mail are designed to look great no matter what device they are read on, but take advantage of our Design Test and Send to iPhone features to make sure your content (and subject lines) work great on mobile. Offer loyalty or other incentive programs that will increase the chance of repeat sales later. Consider something as simple as offering discounts to fans of your Facebook page. Request reviews of your products. Large numbers of positive reviews for your product will drive later sales. Survey customers in order to gather valuable data for targeted campaigns later on. Encourage opt-ins for other marketing channels like Facebook, Twitter, or Pinterest. Messaging the same customers over multiple channels can help drive sales. Announce a website relaunch or a new feature. Use the above mentioned ideas during this preseason time to set up a successful buying season down the road. Responsys’ 2012 Retail Email Guide to the Holiday Season is full of great information and suggestions for email marketers. Smart retailers are learning to match consumers move to shopping earlier in the year with early email campaigns. The exponential growth of iPhone, Android, and other mobile devices is signaling to email marketers the importance of making sure their designs look great on a small screen. Lastly, appropriate messaging during the holiday preseason can pay off big during the final two months of the year. Take advantage of this knowledge, these tips, and Direct Mail to make the most of your email marketing this holiday season!